Zion Park District Executive Director, Marilyn Krieger, wishing Larry Myers a happy retirement after completing 27 years of service at the Park District. Larry Myers retired from the Zion Park District in April after completing 27 years of service. Larry began his career at the Zion Park District in Dec of 1989. He completed his degree in History at Lake Superior State in 1973. Larry was named Ice Arena & Shiloh Golf Course Manager in 1989 and continued his service to the Zion Park District for many years to follow. 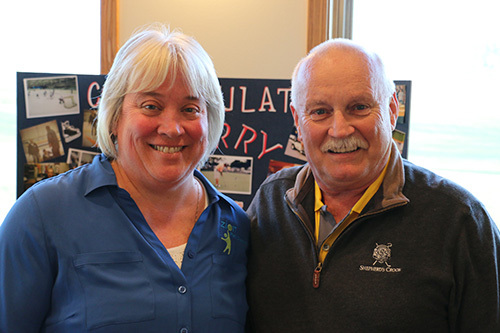 In 1999 Larry assumed responsibility of Shepherd’s Crook Golf Course and served in that capacity up to his retirement. His dedication to the District and to the community of Zion is greatly appreciated.